Review: 5 Stars - The Soul Savers series by author Kristie Cook is hands down one of the best I've read. I will always read anything Cook writes! I was more than thrilled and cheering her on upon learning she was writing Genesis, the Novella. With a goal to explain how everything in the first two books – Purpose & Promise – started, over 2000 years ago. With writing that ebbs and flows, it’s always easy to get lost in the pages, world and story that Cook has created. 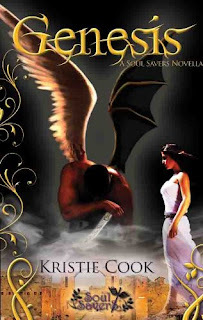 I have found a great connection to her characters and jumped at the chance to find out how the war between good and evil began within her world. Cook did a fantastic job blending her present day characters with this novella and a story that takes place so far into the past. I can see remnants of these new characters from the novella and the characters I have come to love in both Purpose & Promise. All in all, Cook has done it again and further proved to me what a fantastic writer she is. If you haven’t read either of the first two books in this series or even if you have, you should be sure to pick up Genesis to find out how everything in this amazing series started. I am forever a HUGE fan of Cook and am thrilled to be able to get to her know as an author and friend. I highly recommend this whole series to everyone and anyone. You have no idea what you’re missing! Enjoy!